ORLANDO, Fla. (June 7, 2017) - Today, Universal Orlando Resort unveiled all ticket and vacation packages available for guests to experience Halloween Horror Nights 2017. Starting now, guests can take advantage of dozens of new 2017 offers from special Florida resident vacation packages to Halloween Horror Nights Flex Tickets - giving them more flexibility to plan their visit. Halloween Horror Nights Sunday - Friday Flex Ticket ($77.99 per adult + tax) and Halloween Horror Nights Sunday - Saturday Flex Ticket (85.99 per adult + tax): The Halloween Horror Nights Flex Ticket is designed to offer guests the most flexibility and convenience when planning their Halloween Horror Nights visit. Guests can purchase the ticket in advance, visit the event on the night of their choosing and proceed straight to turnstiles for entry into the event. The Sunday - Friday Flex Ticket allows one guest admission to any one Halloween Horror Nights event night from Sunday - Friday. The Sunday - Saturday Flex Ticket allows one guest admission to any one event night. 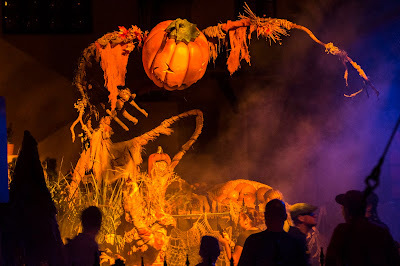 Florida Resident Vacation Packages (Starting at $225 per adult, per night, tax inclusive at Universal's Cabana Bay Beach Resort): Florida residents can purchase a Halloween Horror Nights vacation package that includes admission to the event, 2-night hotel accommodations at a Universal Orlando Resort on-site hotel, and access to ALL THREE of Universal Orlando's theme parks: Universal Studios Florida, Universal's Islands of Adventure and the all-new Universal's Volcano Bay. More information about Halloween Horror Nights 2017 will be revealed soon. For more information, visit www.HalloweenHorrorNights.com/Orlando. Universal Orlando Resort is a unique vacation destination that is part of the NBCUniversal Comcast family. For more than 25 years, Universal Orlando has been creating epic vacations for the entire family - incredible experiences that place guests in the heart of powerful stories and adventures. Universal Orlando's theme parks, Universal Studios Florida and Universal's Islands of Adventure, are home to some of the world's most exciting and innovative theme park experiences - including The Wizarding World of Harry Potter-Hogsmeade and The Wizarding World of Harry Potter-Diagon Alley. And now open is Universal Orlando's third park, Universal's Volcano Bay - an entirely new water theme park experience. Universal's on-site resort hotels, Loews Portofino Bay Hotel, the Hard Rock Hotel, Loews Royal Pacific Resort, Universal's Cabana Bay Beach Resort and Loews Sapphire Falls Resort, feature a total of 5,600 rooms and are destinations unto themselves. Its entertainment complex, Universal CityWalk, offers dining and entertainment for every member of the family. Universal Orlando Resort has unveiled more than 20 new guest experiences since 2010 - powerful attractions, incredible dining opportunities and dramatically themed hotels. Now open is Skull Island: Reign of Kong, a groundbreaking attraction in Islands of Adventure, and CityWalk's newest, unique dining experience, The Toothsome Chocolate Emporium and Savory Feast Kitchen.